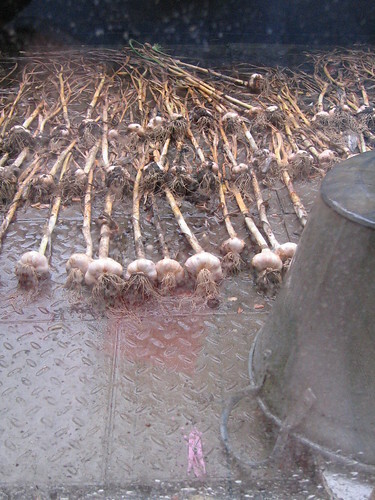 Since we have harvested the garlic and onions we have had nothing but rain. I think this means there will be lots of clove-pealing in my future, and that our unspoilt spoils will be stored under oil this year. I have been enjoying reading your blog but no time to comment lately. They look a decent size at least. The ones we’ve harvested so far are tiny. What are you going to do with your garlic? I have a bit of a garlic harvest this year (not as many as yours) and wonder if I should be storing them under oil. Do they not keep well?